For the 12th time in the last 16 seasons, the New York Yankees are champions of the American League East. They are poised to be the top seed in the Junior Circuit. But can they win the World Series? Well let's be honest, the Yankees can absolutely win the World Series. But since I get paid word for word by the Friends of Flo SuperPAC, gotta break it down. The clear strength of the Yankees is their offense. Hell it may be even stronger than Joey I's back (that may be pushing it). Curtis Granderson has had a fantastic 2011, Robinson Cano has been terrific as usual and the team as a whole leads the league in home runs. The offense will never be the problem with this club and should be able to hit themselves out of any jams. But the cliche is that you need pitching to win in the postseason and the starting pitching is the cause for any concern with the Bronx Bombers. C.C. Sabathia is quite frankly a boss and will carry this unit. Ivan Nova has developed into a solid number two starter and has been very strong of late, emerging as the favorite for AL Rookie of the Year. But Nova has next to no experience in the postseason and he is your number two. Freddy Garcia and Bartolo Colon do have postseason experience and both have surprised many this year, but both have not pitched great of late. Phil Hughes will be out in all likelihood and he's struggled anyways and A.J. Burnett...same old song and dance, he can be fantastic or god awful. 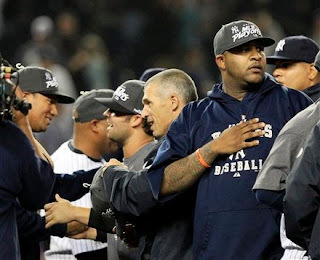 Fortunately, for the Yankees, this appears to be a year where the fellow playoff teams do not look the imposing (then again the Yankees are pretty much always imposing). But didn't we think that last year?